Phoar - what a purple this is! 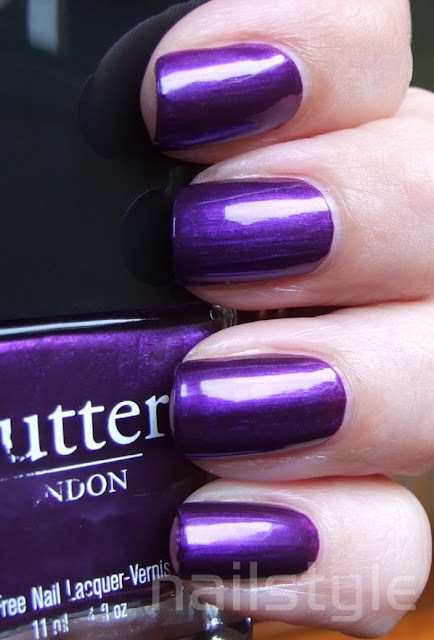 Even in the bottle it's a gorgeous metallic, blue-based purple that can only be described as 'royal'. I had some issues with application as the formula dries very quickly and ended up with two pretty thick coats. This is certainly a striking looking colour and I can't stop looking at my nails! I only realised now that my bottle is missing some text - lol never mind it's what's on the inside that counts eh? !